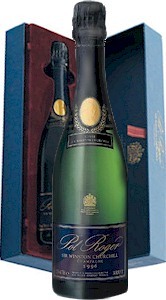 Pol Roger et Cie are one of the few remaining Maison du Champagne, still in the hands of the establishing family. To this day, Roger et fils take personal charge in the selection of Cru and the handling of Cuvees. Pol Roger Vintage Brut is one of Champagne's great wines, a cépage of Pinot Noir and Chardonnay, splendid upon release after several years of age in own bottle under the estate Chais at Epernay. Soft, with a deep palate and extrordinary perfume, a wine of breeding, complexity and finesse. Amongst the Pol Roger assets are many miles of subterranean chalk caves and two hundred acres of vineyards. Roger also retain some of Epernay's finest growers to meet the international demand. Roger's caves include a sub cellar which maintains a constant 9.5°C. This variance of a single degree lower to the upper stratum of caves slows the second fermentation, encouraging a finer mousse. Complex aromas that typify this style of wine result from a painstaking process of storage and agitation in a unique cellaring tradition. Cuvee Vintage Brut is allowed to slowly and quietly mature, treated to an extended rest within it's own bottle, upon it's own sediment, before degorgement et doseage. Golden hues, expansive mousse. Brioche and butter notes, autolysis and yeast, baguette and fresh roast nuts. Textural mouthfeel leaps onto the tongue, an immense palate, primarily of white cherries and apple, reined in by brilliant acids in perfect balance. Engagingly flavourful and highly elegant, savour Pol Roger as the refined effervescence and ebulient sparkle indulges all five senses.